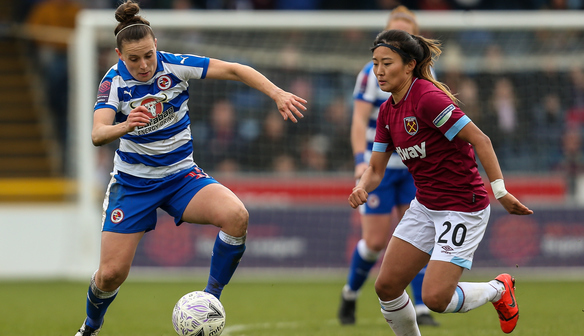 After 120 minutes of a quite brilliant and tenacious Royals display, it was the visitors West Ham United who booked their place at Wembley following a 4-3 penalty shoot-out win in the SSE Women’s FA Cup Semi-Final. It was the Royals applying the early pressure with consistent possession across the pitch. Rachel Furness managed to get on the end of a Fara Williams corner but directed her header over the bar. Despite the good early pressure coming from work with the ball on the deck, it was set-pieces that were causing the visitors problems. Williams had two free-kicks in quick succession. The first was an attempted clip towards the far post which was held by goalkeeper Anna Moorhouse. Minutes later, Williams went for goal from a tight angle but saw her effort fly just over. Jade Moore slammed a first time shot at goal but it got blocked in the cluster of bodies inside the penalty area. At the other end Cho’s corner was met by Gilly Flaherty, whose header sailed high and wide. Into the second half and the deadlock was broken through Furness in the 48th minute. Jo Potter’s clever free-kick out to the right-hand side found Moore and her hooked delivery into the centre found Northern Ireland international Furness, who sent a bullet header back across goal into the corner. West Ham’s response was imminent however and Alisha Lehmann managed to poke into the corner after Reading failed to clear their lines on the 57th minute. 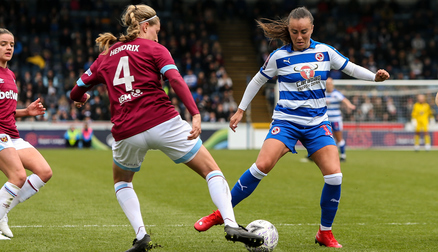 Kelly Chambers’ side started to crank up the pressure after that and when Potter picked up the ball inside the West Ham area and went down under the challenge of Kate Longhurst, the Royals thought they had a penalty, only for the Reading skipper to get hooked for diving. However, minutes later the hosts were awarded a spot-kick when Lauren Bruton’s shot hit the arm of Gilly Flaherty. Williams stepped up but her penalty came back off the base of the post. Reading had a second penalty claim turned down with 10 minutes remaining when Bruton appeared to have been brought down after neat footwork on the byline. The forward then saw her header fly high over the bar after meeting Williams’ looping cross from the left. West Ham were still yet to really get going since equalising but came close when Jane Ross met Flaherty’s drifted free kick but her flick-on header evaded Grace Moloney’s far post. It was end-to-end stuff going into the finalminutes of normal time and somehow the Royals failed to clinch the win. Williams was presented with a great opportunity on the edge of the six-yard box but couldn’t find the space to get a shot away. Into stoppage time and the midfielder was played through but poked an effort just wide of the mark. 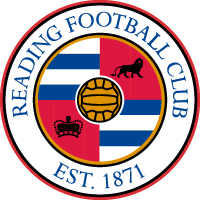 Into extra time it went for the second consecutive round and Gemma Davison’s introduction added a different dimension to Reading’s attacking play. The forward managed to get a shot away after a neat step-over but it was deflected behind. The resulting corner was cleared off the line following a goalmouth scramble. Still level after 120 minutes so to penalties it went. Both teams scored their first but missed their second. West Ham then led 2-1 after three penalties when Adriana Leon scored but Bruton slipped and missed. Furness dispatched Reading’s fourth whilst Kate Longhurst missed so it came down to the final penalty. Both sides scored so it went to sudden death at 3-3. Jade Moore saw her penalty saved while Cho stepped up and scored, sending the Hammers to Wembley.